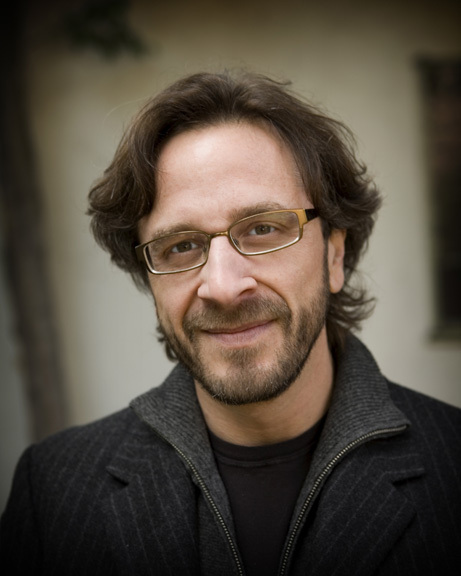 Politically engaged stand-up comedian Marc Maron has filled his plate with gigs recently, doing the hour-long “Break Room Live” show every weekday afternoon at 3 p.m. on AirAmerica.com, a weekly performance of his personal “Scorching The Earth” show (see review) during March, and multiple regular stand-up sets many nights a week around New York, as well as a new double CD, “Final Engagement .” Jester witnessed a recent airing of “Break Room Live,” watching Maron whip through a frenetic take on various news stories with his own opinions scattered throughout, during which it seemed he barely took a breath for 15 minutes or several stories at a time. The show also included one of a few segments included throughout the week where Maron toured his old Lower East Side hangouts. We spoke with him after the show about his varied endeavors in comedy and broadcasting. Jester: Is it tiring doing the show? Marc Maron: We parse [the news] all day and then put some stuff together and then whatever film pieces have to be loaded in, and then I just try to find a through line and try to … Today didn’t have much of a through line but we covered some stories and did some funny stuff, we did some variety, did some chat, did the improvisational stuff. It kinda works all the vessels. A lot of people like it. We have a core group that watches live every day, and a few thousand more people check it out every day. It’s gone through a lot of changes but seems to be its own thing, that’s for sure. J: How long have you been doing BRL? MM: I guess since … trying to think when the first show was. The Break Room was a shift. It will be a year in September. It’s been about six or eight months. My memory is turning into mush. I don’t know why. I think it’s the cellphone. MM: Well there’s another show during the week that has the studio and the equipment till 2:30, so we worked it out. It seems like a good time for people at work to check in and … the live element, it is what it is. I think we have for a live show on the Internet, and there aren’t a lot of them -- certainly not a lot of Internet-specific TV shows -- we do OK with people. It’s a hook for the thing. J: Sam Seder [sometime co-host of BRL] was talking about developing it, also. MM: Sam was aspiring to… the original idea was to develop it for television. The idea was going to be a petri dish to make it a TV show. So him doing more remote pieces and me driving it in the studio was … a move in that direction. That was decided by people who are a little above us. J: Are you in a lot of pieces like the Lower East Side tour? MM: Yea, we do a lot of taped pieces, either the short ones with my cat and the flip camera or larger, produced short film pieces. That ran all week -- [the Lower East Side tour]. I thought it was pretty funny, I thought it was pretty good. It adds a little variety to the show and engages my interest a little more. MM: I got a fax machine, thank God. J: How did you start melding politics and your political views with your comedy and performing? MM: I was always kinda political but not nuanced political. I was a cultural commentator. My comedy has always been that. It’s either self-reflecting or reflecting on broader ideas that are going out cultural. Then when I got the job on the morning show on Air America, I submerged or immersed depending on the day in a more nuanced understanding of politics. That doesn’t come to me naturally. I’m not innately fascinated with the comings and goings of Congress and Senate and whatnot. So I have to work at it. Mixing the two just became a challenge -- how do I make it my own and come from a personal point of view. That requires me to define what stories I’m engaged in and make it more of a broader political conversation and something that means something to me. J: Are you looking at mainly the Post, the Times and New York papers? MM: I look at Daily Beast, Talking Points, Huffington Post, Drudge Report -- we kinda pull from a lot of places. Left to my own devices I would probably just look at the Times. You have to look at these aggregators and figure out what’s popping to you. Sam’s a little more intuitive about that. He’s a little more into it than I am. J: What catches your eye? MM: I’m obsessed with the lies surrounding Afghanistan. I get off on the marginalization of the Republicans right now. I’m still concerned about Christian wackjobs. I like some of the stores like today about Penske buying Saturn -- just stuff that has a broader effect on our lives, as opposed to speculating about what’s going to happen in Congress. What drives legislation is not my strong suit. J: Do you pursue a lot of guests like Richard Ben-Veniste [the 9/11 commissioner and prosecutor]? MM: Yeah, that’s true, definitely. We have good guests and we mix them up, like Eric Bogosian, Gaffigan, we had Douglas Rushkoff, who’s an interesting writer. We had Duncan Jones, David Bowie’s son, who directed that new film “Moon;” James Frey -- the guests are really top quality. I like to mix it up. J: What brought you back to Air America? MM: I needed money. [slight laugh], and this sort of fell into place, in the middle of a nasty divorce. The opportunity came up and I couldn’t turn it down. I had worked here before. That’s not necessarily a reason to come back but this opportunity, creative freedom, to do something new -- it provided all those things for us, and also to make a living. That’s a rare thing that all those things come together.